Big Bob is a large and vast man, sized to fit his native CAS-born Texas. 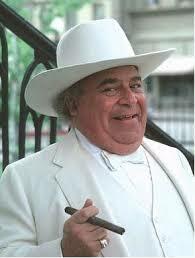 Clad in a white suit, complete with bolo tie and white Stetson, Big Bob's mouth can go a mile-a-minute even with his twangy Southern drawl. Despite his appearance, this seasoned salesman is fiercely intelligent and can out-hustle, out-negotiate, and outsmart damn near anyone on the streets. It's no surprise he's become the go-to in the shadow community for cheap vehicles their owners may, or may not, need to stay attached to. Look no further than Big Bob's Used Vehicles! Y'all come on back and see us sometime; we do love repeat customers. Big Bob knows a lot of sympathetic chop shops around the city. If the fuzz is on the lookout for a vehicle, or the character needs a place to lay low, Big Bob can vouch the character into one of these facilities. After 30 minutes, the vehicle will have a new paint job and should be able to blend in with the crowd while the pawns chase their own tail. If hot pursuit isn't broken off prior to arrival at the chop shop, leading the 5-0 to the location, the offending character permanently loses access to Big Bob and gains one Notoriety. Big Bob's specialty is Ground vehicles. Big Bob, being a trustworthy sort, doesn't sell vehicles with tracking devices in them.